Christina married Stephen on the 18th June 2011 in St Mary’s Church Kington, Herefordshire. Christina is from Kington and met Stephen who is from Dollingstown in Northern Ireland whilst studying at university in Glasgow. The bride arrived at the church and the couple departed from the church in a vintage horse-drawn waggonette pulled by Champ, a white farm horse from Mount Pleasant Farm in Kingswood, Kington. The bride made full use of services offered by Aristocrat Tiaras and chose a handmade bespoke Swarovski tiara based on the Princess Aurora tiara to complement her wedding dress plus Countess Lydia earrings and Lady Aurelia necklace. 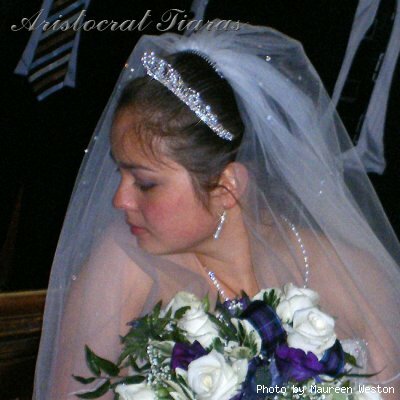 The couple also managed their wedding list using the Aristocrat Tiaras wedding list service.